Bacterial spot infection in tomato transplant houses moves quickly and can cause serious losses. Peter Abrahamian, a post-doctoral associate at the University of Florida’s Gulf Coast Research and Education Center (GCREC), has been studying this disease and its movement in transplant houses. The main objective of Abrahamian’s research was to find out what causes the infection and how it moves from tray to tray. He completed his studies in small transplant houses at the GCREC, as well as in a commercial transplant house in South Florida. According to Abrahamian, many transplant growers come across outbreaks of bacterial spot throughout the growing period. These outbreaks are mostly due to environmental conditions in the transplant facilities. For example, many growers plant in very high densities and use overhead irrigation, which can cause severe bacterial outbreaks. It is important for growers to realize how quickly this pathogen can travel in transplant houses. Once infected, the disease can travel several inches down in the early period of infection. The longer the infection lasts, the quicker it spreads. 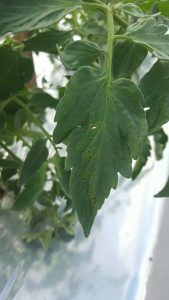 Growers should look out for water-soaked lesions on leaves. Symptoms will begin about three to five days after the initial infection. Abrahamian says those symptoms will advance the longer the plant is infected. The lesions will begin to turn brown and get progressively darker. Right now, there is nothing to truly control this pathogen in transplant houses or to stop its rapid movement. The best method is to take action with sprays as soon as symptoms are spotted. Also, using a different irrigation system rather than overhead irrigation could prevent this pathogen.